Whether it's a nasty 4 on the floor groove, a rockabilly tune, or something a little off the beaten path, I love it! Playing a part in music by serving the song is what I love to do, and I'm willing to go the extra mile to make that happen. My approach is to act like a band member, which I hope always helps me stay more invested in the music. My goal is to always be easy to communicate with, honest, and grateful for the chance to be a part of music. I highly recommend Richard. He’s great drummer and easy to communicate with. Excellent flow! Richard was professional, communicated well, and most importantly, created some excellent drum tracks. Highly recommend him. Richard is very professional. He is an excellent drummer who plays with feeling. He is versatile, flexible ad creative. I highly recommend him. Richard is a solid, creative and professional drummer who is a pleasure to work with! I highly recommend him for your next project - he will definitely make the difference! Okay Richard is definitely a PRO. He delivered excellent Drum tracks, responded fast, quick turnaround and of course that vintage Nashville Drum Tone i was looking for. He offered different versions so i could choose and review for our session. If you are looking for a excellent Drummer with great and honest attitude the wait is over !! I've used Richard on a number of projects that I've worked on and it never fails that he always kills it. He can play so many different styles that no matter what kind of song I need him to track for me, he can do it instantly. His room has a great sound to it and he pays close attention to his tone. Super fast turnover. Excellence at its finest. A: Saints and Sinners by Matt Maher. The record was a lot of fun to play, and the whole tracking process pushed me further than any other project I've done. A: Be honest with me. There's no way for me to help you get what you need if we're not honest every step of the way. A: Analog...in a perfect world. There's a certain warmth, uniqueness, and commitment that comes with analog. Each handmade pre will sound unique to itself. Mostly, unlike digital, you have to make a musical decision and commit to it on the spot. That does something to your mentality while playing. A: I will go the extra mile every time to get a track worth printing forever. A: People. I like meeting and working with people. Those relationships are at the base of every musical experience I've had. A: Is it ok for me to ask you to try this idea? My answer is always yes...unless you're wanting double bass under an Adele song. That, I cannot do. A: Who are you listening to? How can I help you best? What moves you musically? A: Acoustic guitar, my vintage Slingerland kick drum, Istanbul Agop 15" medium hats, any black beauty snare, and drum sticks. A: Art has always been a passion. It started leading me on a path to Industrial Design (designing anything from cars to cell phones), but music took over. Music can do that. It's powerful enough to make a man want to walk away from everything to pursue it with his life. At least, that was my case. I've been living in Nashville now for 10 yrs., and I was able to call music my sole profession starting 6 years ago! A: I mean, who wouldn't want to work with Sir Paul McCartney?! I'm sure it would be a great experience to work with someone who makes such great music without even breaking a sweat. There's no doubt I would leave that gig beyond inspired and full of knowledge I would never have otherwise. A: If it doesn't make an impact, consider the impact of removing it from the song. Example: if compression doesn't make the texture better, don't use it for the sake of using it. A: Living in Nashville, I mostly work on country, CCM/Worship, and a little rock mixed in. When that isn't going on, I write music for licensing to different media formats. A: Tambourine. Definitely the tambourine. A: I'm a guy who will take pocket over flash any day. BUT, I do love the chance to use some chops. Actually, the most important thing to me is to find a "musical home" in the song to drive the melody while keeping it the focus of the song. Basically, my biggest desire is to serve a song by playing exactly what's needed. A: I like to start out listening to the song with the artist's input in mind. Once I feel I have a good understanding of the direction the artist wants to take, I will start laying down some ideas to try and get into the creative space of the song. From there, I send a raw 2 mix to the artist to make sure they're getting what they want. Before sending final iso tracks, I always make sure to edit the audio to fix any minor issues. A: I'm in a somewhat small 3 room studio, but luckily there's a shelf for all the drums! All A/D conversion is done through Apollo converters, and there's plenty of hardware and mics to go around. My favorite part is being setup to record/use acoustic AND electronic drums! 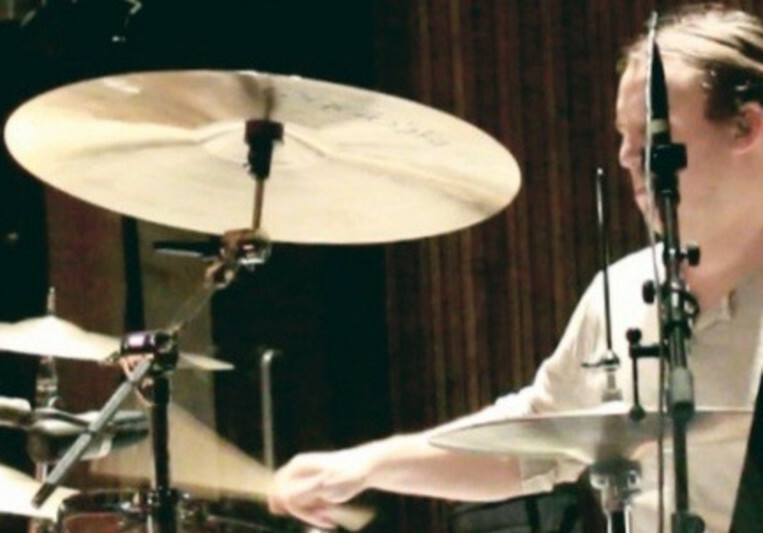 A: Steve Jordan, Dan Needham, and Bonham are among my top drumming influences (Gadd is kind of a given). Lately I've been real into the things Ash Soan is doing. Daniel Lanois and Jay Joyce are always on my go to list for listening. A: The things I get called for the most are tracking the drums and creative perc parts. Everything from country (and demos) to rock, CCM, Indie, and pop. I can't get enough of any of it! Up to 2 passes of isolated drum stems (edited, not mixed). Up to 3 revisions. 5 day maximum turn around time. $25 OFF when you order 3 or more songs!!! It's not typical for this town at all, but I'm having a blast tracking some tunes right now! Doing something out of the norm is always inspiring. It's not often I get asked to help with pre-pro as a drummer. Usually, I show up on tracking day and that's it. I'm excited to be working with Britt Edwards at Center Street Studios in Nashville this week, and pumped about the programming we've done to help his team get ready to make a record!